Below are some recent talks, panels, and classes led by Allison C. Meier. If you’re interested in hosting a talk, drop a line. TV interview on Tony Guida’s NY (May 2018) A discussion of cemeteries, overlooked history, and more! MoMA R&D Salon 19: Death (January 2017) Part of a lineup of speakers invited by Museum of Modern Art curator Paola Antonelli to discuss modern death and culture. Municipal Equation Podcast: Into the Alley (July 2017) Part of a podcast episode on the alleyway in cities. Rosenbach Museum, Philadelphia: Marianne Moore and the Camperdown Elm (January 2017) A lecture on how the modernist poet Marianne Moore helped save a rare tree in Brooklyn’s Prospect Park. London Skeptics Club: Is there anybody there? Victorian Spirit Photographs (July 2017) Can a camera capture ghosts? 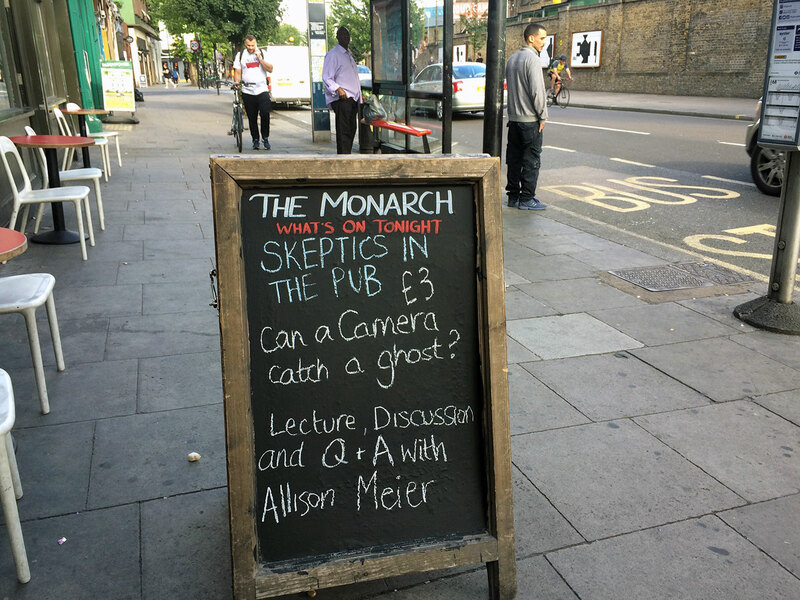 This talk for the London Skeptics Club examined the history of spirit photography in the 19th century. Visual Arts Center of New Jersey: Playground of My Mind (September 2017) A discussion on modern playground design, responding to Julia Jacquette’s exhibition at the Visual Arts Center of New Jersey. PechaKucha 20×20 NYC (September 2016) Discussed staging unconventional events in cemeteries at the evening of short-form presentations. Placemaking in Places of Death: Governors Island (August 2015) A discussion on holding events in places of death, organized by Sextantworks on Governors Island in the New York Harbor. Brooklyn Brainery (2011 – 2018) Periodic classes on cemetery symbolism and New York cemetery history.